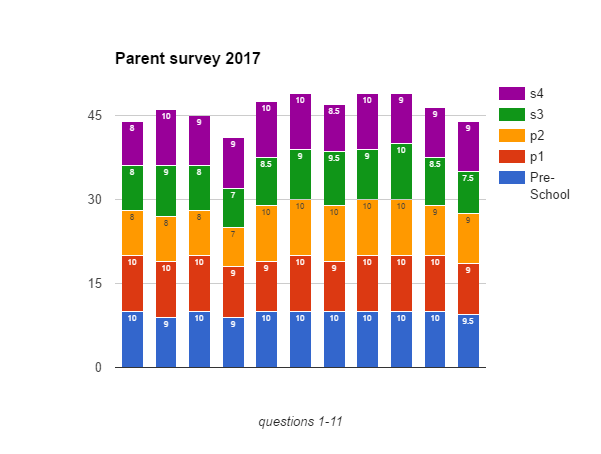 11 Questions were asked of parents. Other highest scores were question 1,3,5,6,7,8,9,10 scoring on average 10. Lowest scored questions were 2,4 scoring on average 9. Although this is still a high score we do need to be mindful of ensuring that parents are made aware of their child’s progress as parents have indicated that they are not as confident with this area compared to other areas of the pre-school. Other highest scores were question 1,2,3,6,8,9,10 scoring on average 10. Other highest scores were question 5,6,7,8,9,scoring on average 10. Lowest scored question was 4, scoring on average 7. We do need to be mindful of ensuring that parents are made aware of their child’s progress as this is clearly an area which they feel less confident. On average scored lower than the other departments. The highest score was question 9 as 10. Lowest score was question 4 which was scored as 7. We do need to be mindful of ensuring that parents are made aware of their child’s progress as this is clearly an area which they feel less confident. Other highest scores were question 2,5,6,8,scoring on average 10. Lowest scored question was 1, scoring on average 8. We do need to ensure parents are made aware of all the wonderful opportunities this department has, especially as they have more opportunities than other departments.